SPC Specialty Tools - Ball Joint / Bushing Tools FORD - Performance Auto Parts - Car and Truck Accessories | JM Auto Racing - Intensify Your Ride! Remove and replace universal joints without “brute force” methods that can cause costly damage. Now you can take on 4WD ball joint service in addition to servicing most cars. A forcing screwpowered press, used with proper adapters, easily removes and installs all press-fit ball joints (inc. GM plastic pin “U” type joints). Comes in a durable plastic case. This tool was specifically designed to remove the original equipment ball joints on smaller cars when installing SPC Performance’s sliding ball joints (pages 58 & 60). With this revolutionary design you can remove the ball joint from the front upper control arm without removing the arm from the vehicle, saving time and costs. Packaged in a convenient blow-molded plastic case this set comes complete with adapters for removing and installing stock or Specialty Product’s sliding ball joints. center forcing screw for heavy duty applications. These adapter sleeves are designed to be used with the 72509 Ball Joint Press. They are designed specifically for easy removal of the stock bushing and installation of the 86330 and 86350 Offset Upper Control Arm Bushings used on 1988 and newer GM light trucks. These adapter sleeves are designed to be used with the 40920 Performance Ball Joint Press. It is designed specifically to remove the stock rear control arm bushings and to install our 66010, 66020 and 66080, 66085 Offset Rear Camber Bushings used on the new Chrysler LX platform cars. bushing out of the stock arm and also to install the new bushing included in the 67465 Kit. The 75990 Mercedes Rear Bushing Press Adapter Set is designed for quick, easy removal of the OE rear control arm bushings and for the insertion of new adjustable camber bushings. This tool set is a must for any shop servicing Mercedes vehicles, and includes a wrench for easy adjustment of the 28840 rear bushing. Easily and quickly remove and install rear trailing arm bushing in as little as 15 minutes per side vs. the factory “book” time of 1.8 hours per side. No need to remove the trailing arm from the vehicle or use a hydraulic press. C-Frame, screw assembly and all adapters to do the job quickly and correctly. Packaged in a durable plastic case. These sockets are used on Chrysler products with screw in ball joints. They have a 3/4” square drive and are four-point with shallow spline. Five tools in one, this handy kit consists of three drop forged forks and two handles. 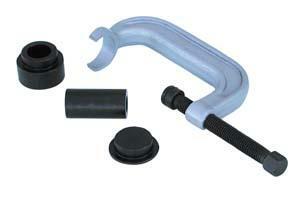 One handle is for use with a hammer and one is designed to fit an air hammer. All forks are threaded to interchange with either handle. Comes with 3 forks of 11/16”, 15/16” and 1-1/8” openings. This drop forged alloy steel tool acts as a tapered wedge and easily separates the tie rod and knuckle. Comes with a 21/32” opening and features a 16” long handle for easy access. This heavy duty, drop forged allow steel, lever-type ball joint and tie rod end remover provides good leverage action to remove stubborn tie rod ends or break ball joint tapers easily. Use when space prevents use of a direct action separator. The 37990 fits 3/4” openings. For use on most cars and some light trucks. The tapered wedge easily removes the pitman arm from the shaft with just a few sharp hammer blows.